Eastern sophomore Sydney Sanders, left, releases a shot attempt over the outstretched arm of Southern defender Kayla Evans (12) during the second half of a Jan. 7 girls basketball contest in Tuppers Plains, Ohio. The high school postseason is just around the corner, but the area roads for the state tournament were paved Sunday afternoon during the 2019 OHSAA Southeast District girls basketball tournament selection meeting. 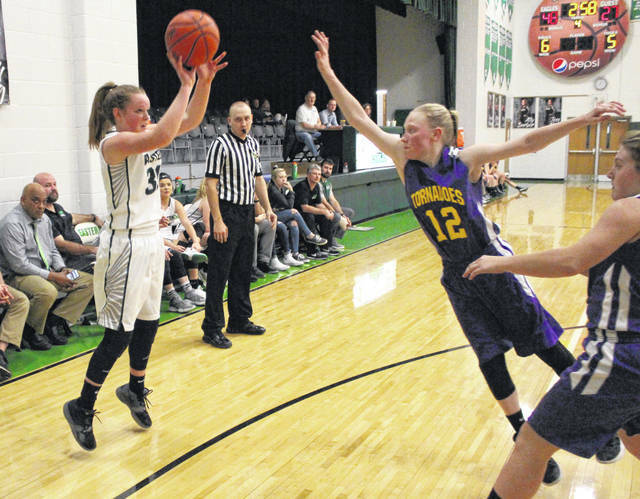 Half of the six local teams need a single win to advance to the district tournament, while three other squads are searching for two victories to get out of their respective sectionals. Eastern came away with the Ohio Valley Publishing area’s highest seed in Division IV as the Lady Eagles enter the postseason as a No. 2 seed and will play in a sectional final at 2:45 p.m. Saturday, Feb. 16, at Meigs High School against the winner of the Southern-Miller contest. Southern earned the 10 seed and will face seventh seeded Miller in a sectional semifinal at 8 p.m. Wednesday, Feb. 13, at Meigs High School. South Gallia earned the nine seed and takes on eighth seeded Ironton Saint Joseph in a sectional semifinal at 6:15 p.m. Wednesday, Feb. 13, at Meigs High School. The winner advances to the sectional final and will face top-seeded Waterford at 1 p.m. Saturday, Feb. 16, at Meigs High School. Switching to Division II, Meigs earned a three seed and will face sixth seeded Athens in a sectional final at 8 p.m. Thursday, Feb. 14, at Wellston High School. The Blue Angels came away with seven seed and face second seeded New Lexington in a sectional final at 6:15 p.m. Thursday, Feb. 14, at Wellston High School. River Valley came away with the eight seed and will face ninth seeded Jackson in a sectional semifinal at 7 p.m. Monday, Feb. 11, at Wellston High School. The winner advances to face top seeded Vinton County in a sectional final at 1 p.m. Saturday, Feb. 16, at Wellston High Schoool. Visit ohsaa.org for complete pairings of the 2019 OHSAA Southeast District girls basketball tournament.